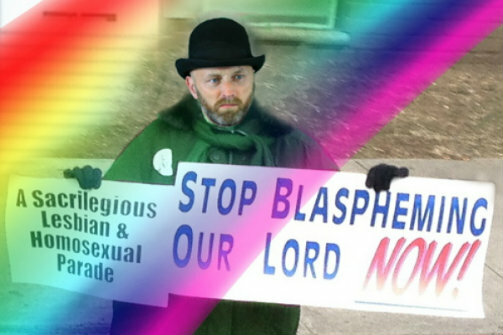 Brian Fleming in A Sacrilegious Lesbian and Homosexual Parade. BOTTOM LINE: A personal account of the history of the St. Pat’s For All Parade, which makes you feel like you’re having a drink at a bar with the performer instead of watching him in a theatre. What ensued was the struggle to establish a more inclusive St. Patrick’s Day parade, and in 2000 the St. Pat’s For All Parade was born in Queens. Theatre artist and musician Brian Fleming made the trip from Ireland and sought to bring along his enormous drum that he manufactured, measuring at 15 feet in diameter. In the end, the drum did not make it to the parade, but it did make it into the Guinness Book of World Records in 2001, as the largest drum in the world. Fleming’s one-man show tells the moving story of the St. Pat’s For All Parade as well as his giant drum’s failed attempt to appear in it. While this piece is essentially a history play, it’s told with a strong personal connection by someone who was a part of that history firsthand. Fleming connects with his audience so successfully that I forgot I was sitting in a theatre. I felt like he was telling me his story over a second round of Irish stout. At the end of the show, Fleming invited the entire audience to keep chatting at a local bar down the block from the theatre. Thanks to his incredibly engaging and warm performance, I felt inclined to go. Unfortunately, I had somewhere to be, and perhaps socializing with the performer I’m assigned to critique is not entirely appropriate. Suffice it to say that Fleming leaves you with a story worth telling, and a feeling that you’ve made a friend.